Absolutely exquisite! This bouquet is a fall flower fantasy come true. All the richness of this colorful season is captured in a stylish glass vase. So pretty, you might have to order one for a friend and one for yourself! 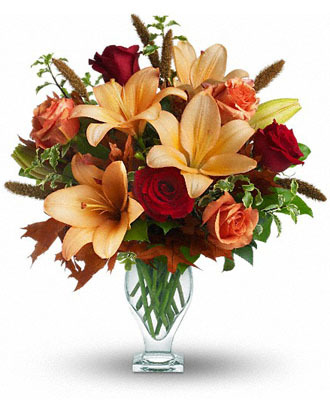 Beautiful orange and red roses, yellow asiatic lilies, autumn oak leaves and more are beautifully arranged in a vase. Isn't fall fantastic?